In 2013, the Aeroflot Group achieved a 38% increase in net income. ASKs and passenger numbers grew by 14%, reflecting both the strong underlying growth in the Russian market and Aeroflot's powerful market position. Revenue growth, at 12%, did not quite match this, but the Group managed to lower its unit costs and hence drive the improvement in profit. As the leading airline group in the Russian Federation, Aeroflot has benefited from its government's smoothing of the path to consolidation, while keeping LCC competition at bay. The government is now ready to allow the development of LCCs domestically and foreign LCCs are making their presence felt on international routes. With Aeroflot now on the verge of setting up its own LCC subsidiary, Dobrolet, CAPA reviews the Group's strengths, weaknesses, opportunities and threats. The Aeroflot Group is the largest player in the Russian market, with 30% of passengers in 2013. Its nearest competitor, Transaero, has 12% and Aeroflot's share is as big as the combined share of the groups ranked second to fourth. 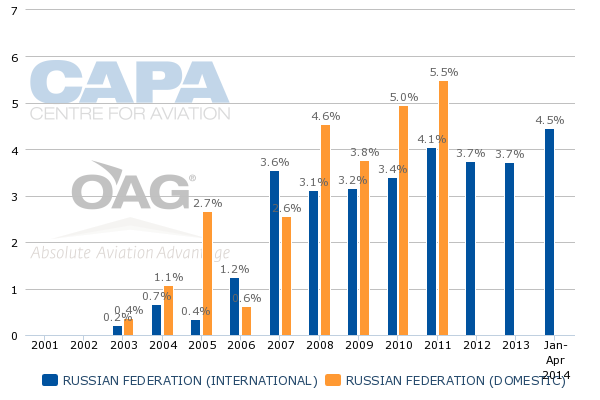 Foreign airlines have only 18% of the market, less than in most other European countries, reflecting the more closed nature of the Russian market. Aeroflot's principal hub, Moscow Sheremetyevo, is undergoing a two stage expansion programme. Stage 1, to be completed by 2017, will see a third runway being built and terminal improvements being made, bringing the airport's capacity to 42 million passengers p/a. In Stage 2, capacity will be further expanded to 64 million passengers p/a, through new terminal facilities and development of the second landing area. Aeroflot dominates its Moscow Sheremetyevo hub, with 85% of seats at the airport (source: OAG, week of 31-Mar-2014), a stronger position than almost any major European national carrier at their respective hubs. Aeroflot Group companies are also the leading carriers at most of the other Group hubs in Russia, which extends from Europe to within a short distance of China, Korea and Japan. The Aeroflot Group includes carriers in all market segments: business, regional, leisure (charter) and (soon to be launched) LCC. This allows it to compete for a wide range of passengers both domestically and internationally. However, in some aspects this strategy can also be considered a weakness (see below). Since the collapse of Avianova and Sky Express in Oct-2011, LCCs have not been a feature of the domestic Russian market. Moreover, LCCs have had only limited penetration of international markets to/from Russia. In the absence of significant LCC competition, Aeroflot’s relatively efficient unit cost structure has allowed it to enjoy fairly healthy margins and traffic growth. The Russian Government is now encouraging the establishment of LCCs through legislative changes and Aeroflot plans to gain first mover advantage through establishing its LCC subsidiary Dobrolet (see below). The Aeroflot Group has been profitable for many years, with no annual losses for at least 23 years (although the subsidiaries acquired in 2011 weighed on its 2012 and 2013 profits). Over this period, other major European national carriers have all made losses more than once. The Aeroflot parent airline's fleet has an average age of 4.5 years, according to the CAPA Fleet Database, making it one of the youngest in Europe, certainly among legacy carriers. With 139 aircraft expected to be delivered by 2020 (source: CAPA Fleet Database), the company's fleet replacement programme should ensure that its average age remains low. This brings advantages in terms of customer appeal, fuel efficiency and maintenance spend. Aeroflot expects its passenger numbers to grow from 31.4 million in 2013 to around 70 million in 2025, implying an average annual growth rate of 7%. If achieved, this implies growth that is faster than the market. Aeroflot's strong position in the Russian market has benefited from a government “national champion” policy, which led to the 2011 acquisition of former state-owned regional carriers. It has been allowed to lead consolidation of the Russian market, while effectively being shielded from LCC competition. With this consolidation phase now substantially complete, the government now appears to be seeking to usher in a new era of LCC-led aviation growth and Aeroflot has been given the opportunity to drive this development in the domestic market before taking it to international markets. 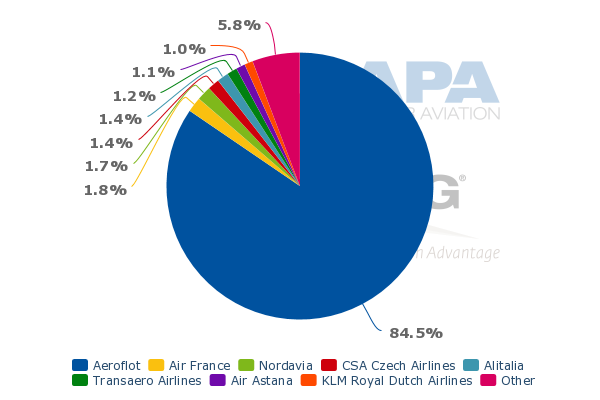 Aeroflot is among the more cost efficient European legacy carriers, judged by its position on the chart below (based on 2012 results). With a similar average sector length to major flag carrier groups such as Air France-KLM and IAG, it has unit costs that are 20% to 30% lower than those groups. In 2013, the Group's subsidiary airlines made a combined net loss of USD105 million, although they managed to achieve a positive operating profit of USD14 million. Both figures were an improvement from heavy losses in 2012, but the subsidiaries continued to weigh down the Group result of USD230 million at the net profit level. If they can be restored to profit, the subsidiaries offer a substantial opportunity in terms of improving the Group result. This is also a strength (see above), but the Aeroflot Group's presence in all market segments and geographies means that it does not have a focus on a strong core competence. The challenges of being all things to all people, and the consequent complexity, can mean that management is spread too thinly. It can also make brand maintenance more complex. Aeroflot has been a member of SkyTeam since 2006. Its public position, as summarised in its recent Capital Markets Day presentation, is that membership allow it to increase its presence on existing markets and to enter new markets. Indeed, it said that SkyTeam gave it access to 87 incremental markets in 2013 (up from 63 in 2012). However, Aeroflot is notably not a part of the trans-Atlantic joint venture that lies at the heart of SkyTeam, having reportedly been blocked from entering the JV by the two leading members, Delta and Air France-KLM. There were even reports in mid-2013 that Aeroflot was considering leaving SkyTeam altogether, although these reports have been downplayed by the carrier. In Sep-2013 the Aeroflot board said it had decided Aeroflot would remain in SkyTeam. The Mar-2014 Capital Markets Day presentation made reference to "strengthened" relationships with Delta, Air France, KLM, Alitalia and China Eastern. What is clear is that Aeroflot views partnerships with other carriers as a very important element in achieving its growth plans. If SkyTeam cannot provide all that it wants, it looks increasingly likely that it will turn to airlines outside the alliance to forge bilateral relationships in order to serve these ends. Of course, the potential to meet its needs through new relationships is also an opportunity. Aeroflot estimates that total passenger numbers in the Russian market will grow at a compound average growth rate of 6.1% pa from 2013 to 2018. In addition to the superior market growth enjoyed by most emerging markets, driven mainly by superior GDP growth and relative under penetration of air travel compared with more developed markets, Russian aviation is also benefiting from the modernisation of its infrastructure. Moreover, Moscow's hubs are increasingly serving as hubs for transfer traffic between CIS countries and long-haul destinations such as North America. Moscow also has some geographical advantages to capture some East-West global traffic flows. For example, Moscow is positioned more or less on the great circle route between New York and Mumbai and between Milan and Shanghai. Transfer traffic provides incremental traffic growth potential for Aeroflot. The parent company airline saw transit traffic grow from 30% of its passengers at Sheremetyevo in 2011 to 35% in 2013. The Russian Government is gradually renegotiating bilateral air service agreements with the governments of other nations to allow greater access. This will lead to more opportunities for Aeroflot (- although it also opens up the potential for increased competition from foreign carriers in what has been a protected market). Aeroflot has four Russian subsidiary carriers; Rossiya (St Petersburg regional carrier). Donavia (Rostov-on-Don regional carrier), OrenAir (Orenburg charter carrier) and Aurora (Far East regional carrier formed from the merger of Vladivostok Air and SAT Airlines). Donavia is already fully integrated into the Group and Rossiya is 100% operated by Aeroflot as of Apr-2014. The subsidiaries extend Aeroflot's domestic network and their further integration should lead to further optimisation of this network. Aeroflot is close to launching its LCC subsidiary Dobrolet in the domestic market and is awaiting its AOC. It expects ticket prices to be around 20%-40% lower than mainstream carriers and that this will stimulate new demand (rather than cannibalise existing Aeroflot sales). Adopting classic LCC strategies, Dobrolet expects to achieve lower costs through seat densification and direct sales channels. In addition, it plans to maximise revenues through the unbundling of features such as checked baggage, priority boarding and catering and to generate ancillary revenues through its website. Aeroflot has a strong position on many domestic routes and is the overall leader in the market. Nevertheless, it faces a greater number of competitors (and on a greater proportion of its leading routes) in the domestic market than on international routes. Transaero, S7 Airlines and UTAir all provide more significant competition in the domestic market than Aeroflot faces internationally. As part of the gradual process of the liberalisation of market access, Aeroflot is seeing a growing level of competition from LCCs, in particular on short and medium-haul international routes to/from Europe. The carrier's recent capital markets day presentation referred to "Aeroflot's superior product quality and competitive cost structure" as being "winning factors". This is something of an echo of the response of Western European legacy carriers to LCC competition when the new entrants started to pose a threat in the 1990s. Their experience suggests that Aeroflot cannot afford to be complacent, as cost conscious travellers voted with their feet, discarding the need for full service products on short haul. Aeroflot cost structure is competitive when compared with European FSCs, but not with LCCs. If its LCC Dobrolet is successful in the domestic market, it may also become a useful weapon on international markets. Although the threat from geopolitical events such as war, terrorism, epidemics and natural disasters is a generic one facing all airlines, the crisis in Ukraine highlights that it is perhaps a more significant one for Aeroflot than for its counterparts in Western Europe at the moment. There were temporary restrictions over Ukraine airspace in Mar-2014 and Aeroflot shares fell heavily at the outset of the crisis. At present, the Group's operations in Crimea are continuing – it has even announced plans to increase capacity to Simferopol – but it is cutting fares to stimulate demand. It appears as though Aeroflot is fulfilling the Russian Government's desire to integrate Crimea into Russia. While it is a listed company, Aeroflot remains majority owned by the Russian State and is scarcely free of government influence - including the danger of having to perform as a national instrument. Overall, however, the Russian Government's benign influence on Aeroflot has been extremely helpful. It has allowed a relatively orderly series of changes in the Russian aviation market, with Aeroflot the main beneficiary. As other European legacy carriers felt the pain of severe LCC competition, the latter were effectively excluded from Russia while Aeroflot was encouraged to lead domestic consolidation. Now, more or less on its own timetable, Aeroflot is being encouraged to lead the development of the LCC segment in Russia. This is an opportunity upon which it must capitalise before the competitive environment changes forever.